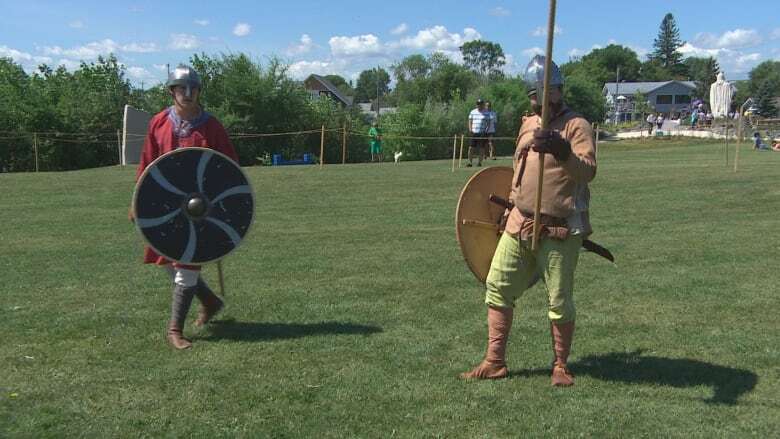 Medieval history has come to life in Gimli this weekend with daily Viking battles and a village set up to resemble a Nordic community from more than a millennium ago. Medieval history has come to life in Gimli, Man., this weekend with daily Viking battles and a village set up to resemble a Nordic community from more than a millennium ago. Combatants in the Viking battles use handmade replica weapons and historically inspired costumes. This year's battles represent a conflict between a jarl, or king, and his son who has grown tired of his father's rule. Each side has its supporters, and they all battle it out on the field using a variety of weapons. Some of the weapons they use were very common in the Viking age, which lasted for about 300 years beginning around 800 CE, said Nicole Egli a participant with Vinland Vikings, the group organizing the battles. One of the traditional weapons used is called a seax, a type of knife that would often be used for cutting food as well as defence. Other fighters carry a Dane axe, or long axe. "To use this successfully in battles, we have to have a lot of training. So within our organization, we try to stay as safe as possible we do training all year long, and only the advanced warriors are allowed to safely manipulate the Dane axe and the swords on the field," said Elgi. Combatants have to wear helmets and safety gloves with additional padding. "Our goal is to entertain but to do so in a way we don't get injured although they are blunted weapons getting struck by metal moving quickly is very painful," she said. Between 45 and 50 people participate in the battles. Islendingadagurinn started on Aug. 4 and runs until Aug. 7. Sunday's events include a fris-nok tournament, a sport played throughout the Interlake with one simple objective - knock an empty bottle off a post with a Frisbee. Gimli is located about 85 kilometres north of Winnipeg.